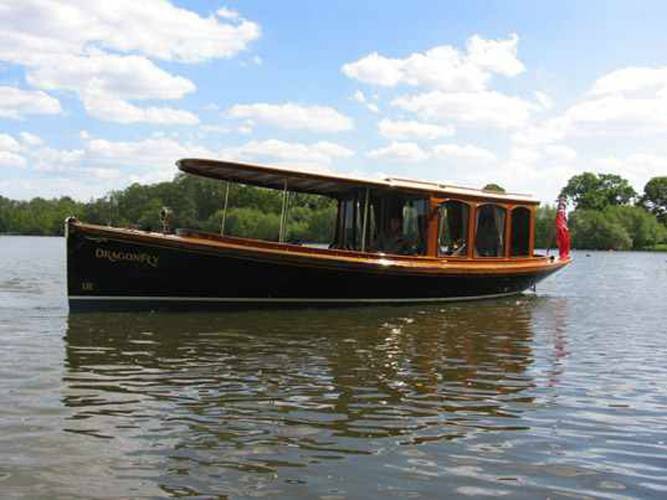 Dragonfly is probably the most beautiful charter boat on the Thames, built in 2010 by Creative Marine in Norfolk. 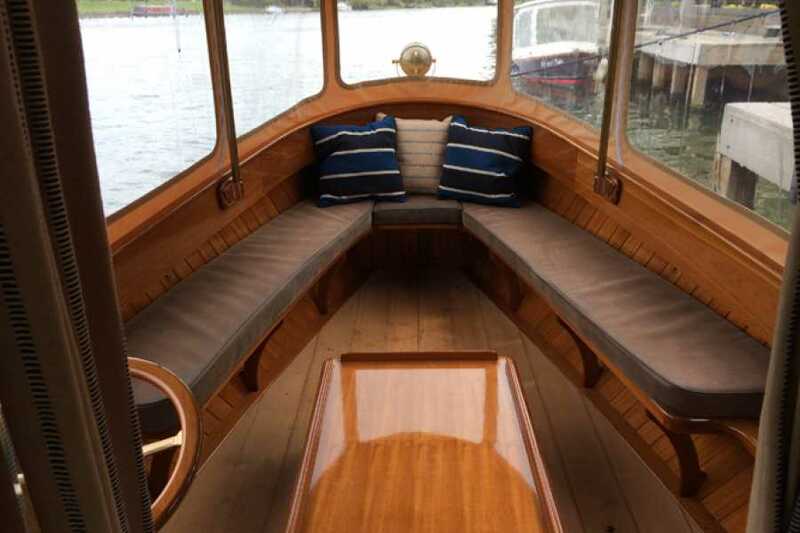 The forward cockpit has solid mahogany bench style seating for up to 8 people while the cabin interior has an oak framed ceiling and a further two bench seats. 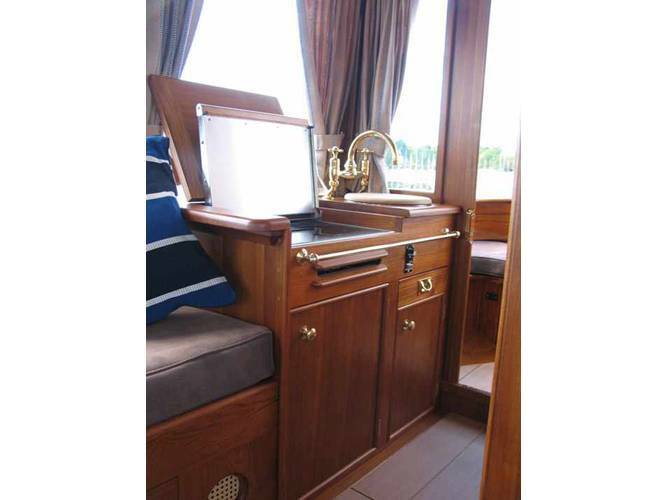 Towards the stern, the galley offers a fridge, sink, and cooker/heater as well as a separate flushing W.C. complete with vanity unit and mirror. 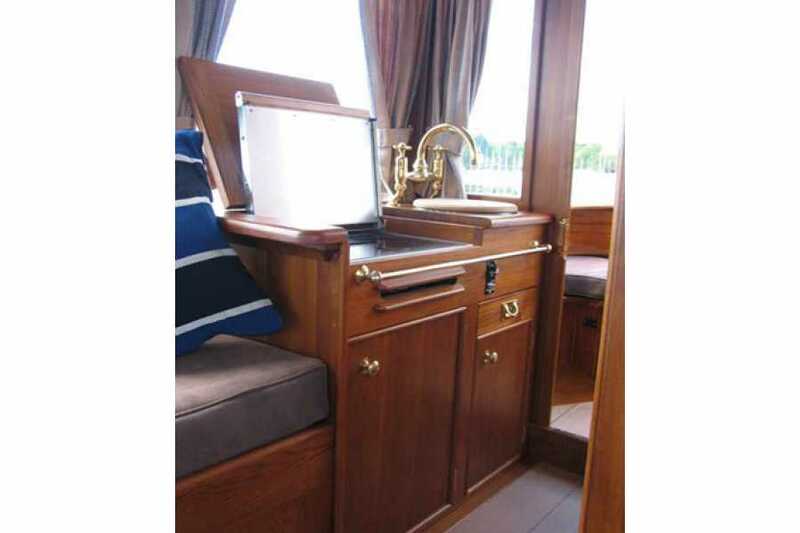 A solid mahogany door leads to a 'hideaway' seating area for up to 3 people at the back of the boat. 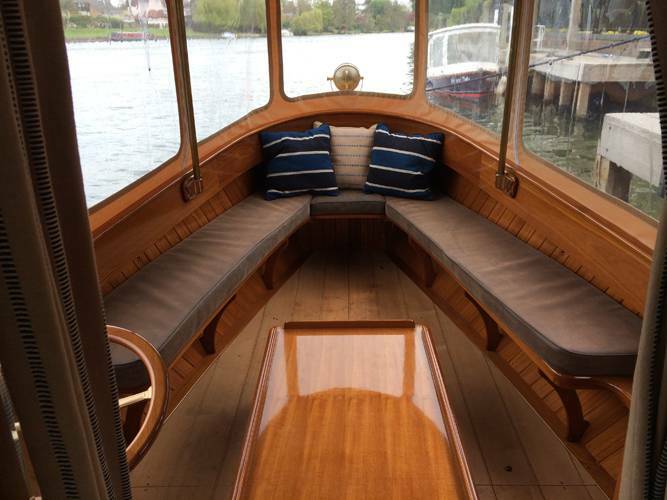 All the seating offers faux leather cushions with all upholstery of a similar standard to the rest of the boat. Dragonfly is 31 feet long and would be ideal for up to 10-12 people with champagne and canapes en route to a top quality restaurant or hotel or for coffee after lunch. Alternatively, we could provide a Halal Afternoon Tea for up to 8 people. Dragonfly is based in Maidenhead. Perfectly positioned to cruise between Marlow and Windsor, an area that includes The Compleat Angler Hotel, Cliveden, The Waterside Inn, The Hinds Head, Fat Duck, Bray Cottages, Monkey Island Hotel, Oakley Court Hotel and Windsor. Dragonfly is weatherproof, has Hot & Cold water, a W.C. and central heating in case of cold weather. All of our vessels are hired with a fully qualified experienced skipper, Certified under the Boat Safety Scheme, carry £5 million passenger liability insurance, lifejackets, first aid kits and firefighting equipment. Additional hours at any time £160 per hour. Please note we charge a nominal fee of £25 to customers wishing to bring their own food or drink. This covers the cost of providing glasses, cutlery, ice, rubbish disposal and additional cleaning.